When you look at the plans of a Master, like John Atkin, everything you need to know is right in front of your face. It's in the plans... in the boat's DNA. The trick is seeing it. On this Day 10, I was sailing along at full speed, a fresh wind on my quarter, when I suddenly struck Blind Rock. I didn't know what had happened, only that I was stopped dead, unable to move forward. I'd been trying to mount Cabin Boy's transom on the frame, in preparation to lining off the planks. Since I was merely adjusting my fabulous transom-mounting micro-invention, I figured this would be a 5 minute job. I'll use my own words to make my argument: "Still, if I had more time, I'd probably take the time to build the jig. It would probably be a tad more precise." If you recall, I had to invent a clamp to hold the stem in the correct place on the frame. Since the leading edge of the stem lined up perfectly with the cross piece on the ladder frame that represented Station A, this was easy. 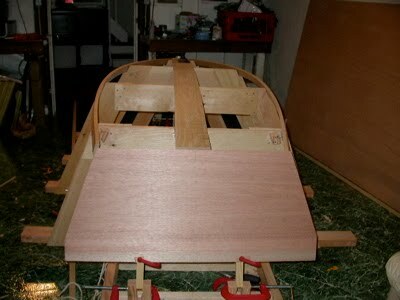 When it came time to mount the transom, I just could not visualize how to build a jig to position it in space. And none of my boat building books was any help. They just vaguely referred to a jig, but didn't give an example that seemed to apply to Cabin Boy's design. Stumped, I decide to use a variation of the clamp I had used in the stem (see photo, above.) The beauty of this system was that it was infinitely adjustable. The question I should have asked myself was: why did I need an infinitely adjustable system? My quote, above, answers that question: because I didn't take the time. With my adjustable system, I didn't need to! I could just 'fiddle' with it, until it looked right. Disaster Averted? I don't think so! Despite my confident assertion, yesterday, that "Disaster had been averted! ", when I'd trimmed the chine logs and tried to line up the transom, it just didn't work. The lines of the keelson, chine logs, and transom just didn't come together. Something was wrong. Oh blast... How could I have been so stupid!?!? I had lined up the top of Cabin Boy's transom with Station 5. I should have lined up the bottom! Because of the rake in the transom, this small error meant that the transom needed to be pushed back about 2 1/2". Just as I suspected for a few moments on Day 11, before talking myself out of it. How had I made this mistake? 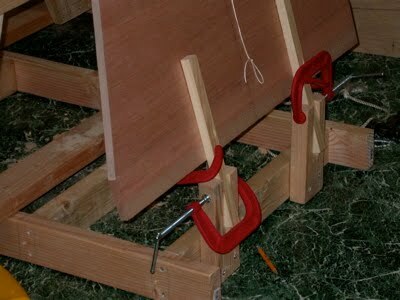 But I think the main reason was giving myself permission to take the short cut of using my adjustable transom clamp. If I had forced myself to figure out how to build the fixed jig, I probably would have discovered my error in the process. By short-circuiting that process, I spared myself the opportunity of finding the error. Ironically, by the time I had figured out what I'd done wrong, I knew exactly how to build the jig. And it was really, really simple. All that's needed is a pair of boards cut at the right angle. And where does this angle come from? Right off the plans! In fact, I could have taken a pattern right off the lofting board. Easy to say now, but until today, I just couldn't see it. A strange form of blindness, when you can't 'see' what's right in front of you. Not exactly rocket science, eh? You just need to measure the rake angle off the plans... in Cabin Boy's case, about 12 degrees. Then, just cut the angle. I measured the distance from the Base line to the bottom of the transom to get the location of the notch, but that didn't work out because of the extra wood at the top of the transom, that still needs to be trimmed off. No matter, it was easy enough to screw a spacer into the correct place on the ramp, so that the transom was held at the right height. Note the spacer blocks that boost the transom to the correct height. So two of these jigs, attached to the outside of the ladder frame, held the transom at the right height, at the right angle. And how about the fore an' aft location of the transom? That distance was also noted clearly on the plans. The bottom of the transom (top, in photo, because boat is upside down), should be directly over Station 5. Easy-peasy. A fixed jig to hold the transom in place. And that's all there was to it. With the jig firmly affixed to the frame, I didn't have to fool with 4 clamps and an infinitely adjustable system. I knew the transom was fixed in the right place, at the right angle. Forever. Grrrr! So simple! So hard to see! And such a relief to finally get it right. I'd love to hear your tales of discovery, and I'm sure others would, as well. Feel free to leave your own stories in the comments section below! Maybe tomorrow I will finally line off the hull. Wow! Hey John. just remember. "...Experience..." comes from making mistakes AND learning from them. Thanks for the play-by-play blogs. Being included just means I can proudly say, once CABIN BOY is finished, "I KNEW HIM WHEN..."
By the way, does she have a proper name yet??? One of my (MANY) idiotsynchrcies is that I had to have a name picked out for EVERY boat, before she was started, even if I am bujilding her for someone else.... Yeah, yeah.. Go figure. Love this blog! Thanks for the effort!